Edited by: Karl Rahner with Cornelius Ernst and Kevin Smyth. Sacramentum Mundi Online is the online edition of the famous six volume English reference work in Catholic Theology, edited (in 1968-1970) by Karl Rahner, one of the main Catholic theologians of the 20th century. Sacramentum Mundi: An Encyclopedia of Theology was originally published by Herder Verlag, and is now available online at Brill. A theological work that intends to be truly contemporary, truly relevant to the present moment of history, must do more than merely restate in a modern idiom the traditional doctrines and practices of Catholicism; it must do more than merely update earlier teachings by bringing them into line with the teaching of Vatican II. A serious work of theological scholarship that intends to be truly contemporary must be written in response to the spiritual needs of presentday man and must organically incorporate into its structure the insights of this historical epoch. Hence the significance of the title of this work: Sacramentum Mundi. This is not just another Catholic encyclopedia, another lexicon or dictionary of religious information. Rather, as its title indicates, this is a unified theological synthesis animated by a single ideal, written out of a definite religious perspective, and going towards a precise goal. Sacramentum Mundi cannot be theology for a specialized group of professionals; Sacramentum Mundi cannot be academic theology; Sacramentum Mundi can only be theology written in and of and for the world where man dwells and God reveals Himself. Sacramentum Mundi has been in preparation since the beginning of the Second Vatican Council, and is now being published in English, Dutch, French, German, Italian, and Spanish editions. Written by an international group of more than six hundred scholars, the complete six-volume work will contain some 800 separate articles on all the central themes of modern religious thought from dogmatics to canon law, moral theology to catechetics, church history to comparative religion. The concentrated, alphabetically arranged presentation combines precision and depth of thought with a lucid, uncluttered style. Each entry is amply cross-referenced and supplemented by a select bibliography. As a summa of post-conciliar theology Sacramentum Mundi will be the essential reference work for theologians, priests, teachers, students, and laymen. It will be indispensable for any religious library as well as for the larger public collections. Edited by: Karl Rahner SJ, Münster and Juan Alfaro SJ, Rome - Alberto Bellini, Bergamo - Carlo Colombo, Venegono - Henri Crouzel SJ, Toulouse - Jean Daniélou SJ, Paris - Adolf Darlap, Munich - Cornelius Ernst OP, Oxford - José Fondevilla SJ, Barcelona - Piet Fransen, Louvain - Fergus Kerr OP, Oxford - Piet Schoonenberg, Nijmegen - Kevin Smyth, Paris - † Gustave Weigel SJ, Woodstock. 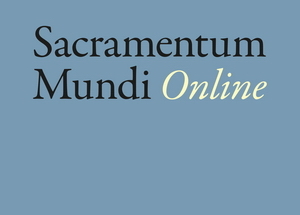 “Sacramentum Mundi” is an international theological encyclopedia which is being published simultaneously in six languages (English, Dutch, French, German, Italian and Spanish). It is an attempt to formulate present-day developments of the understanding of the faith, basing itself on modern theological investigations of the key themes of the theological disciplines, in the hope that they will thus be fruitful for personal reflection in faith and in practice. The developments in question may be characterized as a thinking which takes fully into account the conditions of past and present historical growth in the understanding of faith. It has therefore a strongly marked orientation to the future – its historical dimension – and is also marked by its openness for the other Christian Churches, the non-Christian religions and for the world in general – its social dimension. To make what is hoped to be a Summa of modern theology easily accessible to the enquiring and open-minded reader of today, both clerics and lay people, the encyclopedia is presented in alphabetical order. While normally an encyclopedia is supposed to offer matters to be looked up and used on occasion, but precisely not what one needs to remember permanently, here the opposite goal is aimed at. The fundamental effort is to furnish the truths which should be the constant and vital possession of the believer as he tries to answer for his faith and his hope and the promise which it contains (1 Pet 3:15). It should be clear that such an undertaking cannot be carried out in the same way for all the terms and concepts of the theological sciences and that as a first effort in this direction it may not be equally successful in dealing with all relevant themes. In some cases it was possible to adopt the findings of earlier discussion of certain themes, which only needed to be pin-pointed and completed in view of the purpose of this work. The work is the product of an international editorial board, which collectively assumes responsibility for all the editions in the various languages. The contributors are also drawn from many countries. The international character of the team of collaborators was meant to provide an example of the co-operation between theologians of many lands which is so necessary in the post-conciliar epoch, and was also considered a means of avoiding one-sided emphases. The editors also recognized, however, that such international co-operation would inevitably demand from all a certain patience and openness with regard to what might seem alien. The differences in the articulation of the various themes, due to the various theological backgrounds and hence thought forms of the authors, have not been smoothed out by the editors, but deliberately left standing. The six editions are substantially identical; but this does not mean that the various national editors have not made some adaptations to suit the genius loci of each region. In the present state of Catholic theological writing in English no one could doubt the usefulness of a comprehensive survey of central theological topics conducted by a group of writers in basic sympathy with each other, whose theological views have emerged from a serious and disciplined study of the relevant sources and from an awareness of the problems posed by life and thought in the modem world. The views expressed are of course authoritative only in the sense that they are put forward by serious theological authors ; they are not offered as definitive, and the highly selective bibliographies supplied are meant to be used not only as a guide to further reflection but also as a means of testing the well-foundedness of the views proposed. The fact that this work is appearing simultaneously in several languages should contribute to the reintegration of Catholic theology, no longer on the basis of an artificially preserved scholasticism, but of a wider tradition of theology in which the creative scholastic thinkers find their proper place: this living tradition is not closed but open to every valid original development. After the premature death of Fr. Gustave Weigel, S.J., the original editor of the English edition, responsibility for the English edition was assumed by the present writer and Fr. Fergus Kerr, O.P. Mr. Kevin Smyth, who had already done so much for the encyclopedia, finally assumed editorial responsibilities, and it is to him that the English edition in its present form is due. Of the numerous translators who have made this edition possible, apart from M'r. Smyth (philosophical, biblical and other articles), special thanks are due to Mr. W. J. O’Hara (articles by Fr. Karl Rahner and others), Mr. Richard Strachan and Fr. T. Hamilton, S. J. (historical and socio-political questions), Mr. A. David Lewis (Church history), and Dr. David J. Bourke (biblical exegesis). In its English edition, the encyclopedia will be complete in six volumes; a detailed index will be found at the end of the last volume. The following list does not include biblical and other well-known abbreviations. Whenever an author, not listed below, is cited in an article by name only, followed by page number(s), the reference is to a work listed in the bibliography at the end of the article. Karl Rahner, together with Adolph Darlap, began work on Sacramentum Mundi in 1961, just before the start of the Second Vatican Council. It was conceived from the start as an international project, and was eventually published simultaneously (or almost simultaneously) in six languages—German, French, Italian, Spanish, English and Dutch-- by Rahner and thirteen editors. The four volume German edition came out from 1967-1969; the six volumes in English, from 1968-1970. Three things make Sacramentum Mundi stand out from the profusion of theological dictionaries and encyclopedias published in the last century or two. First, it is this international quality, involving scholars from across Europe (and to a certain degree America), whereas the norm is for a dictionary or encyclopedia to have a certain insular quality—written in German by and for German language scholars, or in English by and for theologians of the English speaking world, and so on. Secondly, there is the fact that it was edited and shaped by Karl Rahner, one of the leading theologians of the 20th century. One does not find anything like it from Barth or Balthasar, Tillich or Bultmann—Rahner alone among the great minds of this great theological generation turned his attention to forming such a distinctively collaborative intellectual endeavor. Thirdly, it offers itself not just as a reference work, available for occasional consultation, but as a Summa--something from which one can gain, in other words, not only bits and pieces of theological information, but a vision of the discipline as a whole in its coherence. Sacramentum Mundi reflects Rahner’s conviction that the era of the ‘renaissance man,’ of the individual intellectual capable of knowing and synthesizing everything necessary for a full articulation and defense of the faith, is a thing of the past. If one is going to write a new Summa, it needs to be done in a collaborative way such as this. Compared, then, to Barth with his Church Dogmatics, or Balthasar with his voluminous Trilogy, Rahner’s approach is marked by a certain modesty. At the same time, however, Sacramentum Mundi testifies to the confidence and hope-filled quality of the period in which it was written. The chafing constraints of neo-scholasticism, of a narrow textbook theology bound to a restrictive interpretation of Thomas Aquinas, were gone from Catholic theology. The retrievals of biblical, patristic and medieval traditions, in what has come to be known as the Ressourcement movement, had enriched and broadened the intellectual world of theologians. There was the excitement of engaging with the best of Protestant thought, and with powerful currents of modern philosophy. There was a feeling that in the Second Vatican Council, which had closed only three years before the appearance of the first of these volumes, the Catholic Church had fundamentally reoriented itself towards the world beyond its borders. And there was the sense that all this could be drawn together, integrated, and presented in a new, collectively owned theological synthesis—a synthesis which, if not so rigid and limited as the abandoned neo-scholasticism, could nevertheless offer a genuine coherence of its own. Nearly half a century on, our confidence that a sense of the whole of theology is within our grasp—even collectively-- may not be so strong. Nearly half a century on, too, we are aware of a range of themes which have become important which cannot be found here. And yet nevertheless we continue to benefit from the freshness, the intellectual power, and the wisdom on display in this most fascinating of encyclopedias, coming from a generation whose theological depth and vision has not been equaled since.